We had a rest in Kanab to let Brian’s insect bites recover aided by cortisone cream, food, coffee and beer! We liked Kanab. Firstly there is the great little outdoor shop ‘Willow Canyon Outdoor’ where you can sit in with a nice coffee and relax. Also we headed out to a pub called ‘The Dog House’ which is a vegan eatery as well. We had vegan cheeseburger pizza and listen to a live bluegrass band playing outside. Sign says ‘WAG MORE, BARK LESS’. We had two hitches and a bit of waiting to make it out to Jacob Lake where we met another Arizona Trail hiker, Treker4(?) 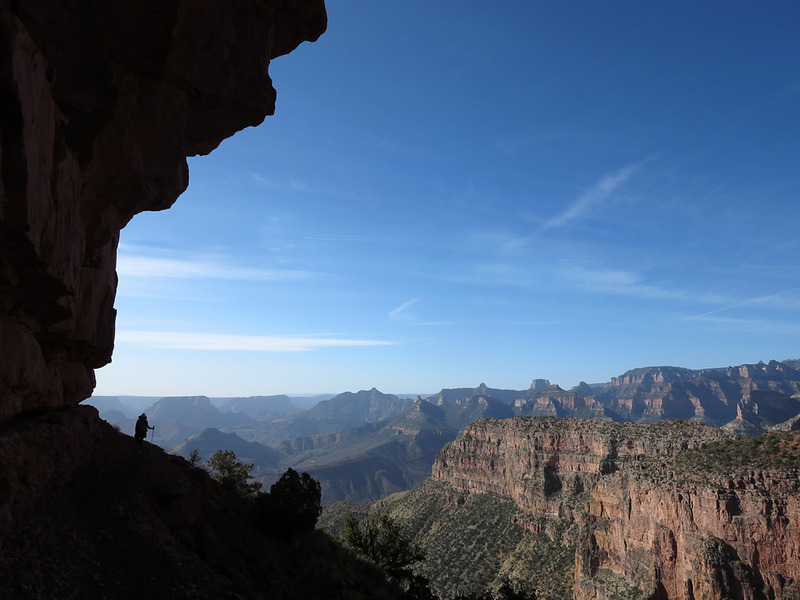 Being a bit behind our permit dates for the Grand Canyon, we decided to hitch forward about thirty miles to Grand Canyon north rim vehicle entrance and hike for a two to three miles back onto the trail from there. 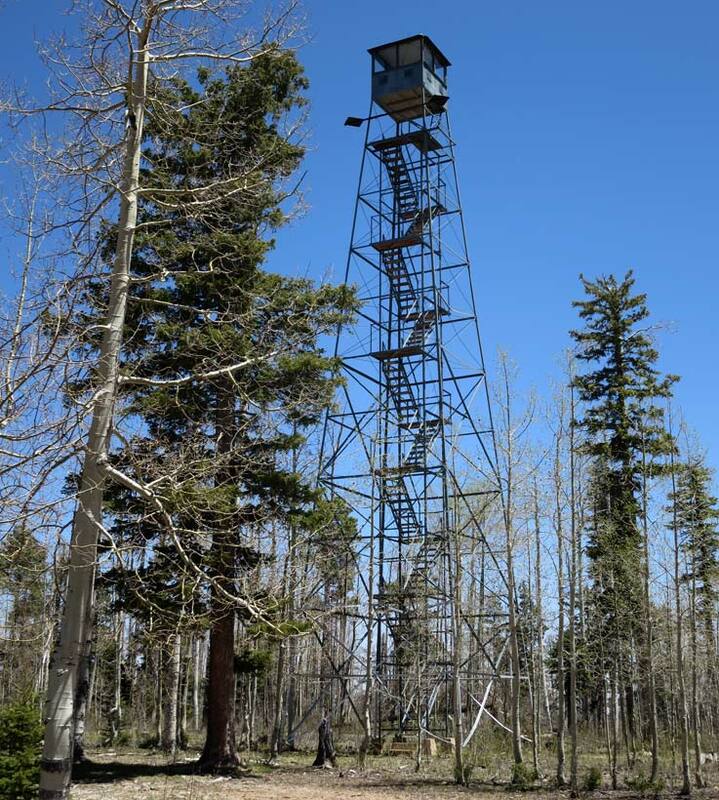 This also gave us the chance to see a fire lookout tower that the writer and inspiration behind the Hayduke Trail, Edward Abbey, worked at. A wonderful couple from Wisconsin gave us a lift as soon as we wandered out onto the gas station forecourt to stick out our thumbs. The lookout tower was cool and we were able to scramble up the tower but unfortunately the cabin at the top was locked. We then hiked along the Arizona Trail at around 9000 feet elevation before rejoining the jeep road of the Hayduke towards Nankoweap Trailhead. Carrying heavy loads with 7 days food and water to do us until the next afternoon made for sore feet. The hiking was easy though through ponderosa and aspen forest and we even glimpsed a couple of squirrels but were unsure if they were the famous Kiabab species. Our first views of the Grand Canyon itself came when we reached the Nankoweap jeep track trailhead around 5 pm. It was hazy but even so it was impressive as our first ever glimpse into the Grand canyon itself! We hiked onto a ridge protruding into the canyon over a hilltop then down onto a small plateau where we set up camp under some ponderosa at a lovely spot. An evening stroll along the rim of the canyon to catch some late sun catching the cliffs of the canyon walls was a pleasure. 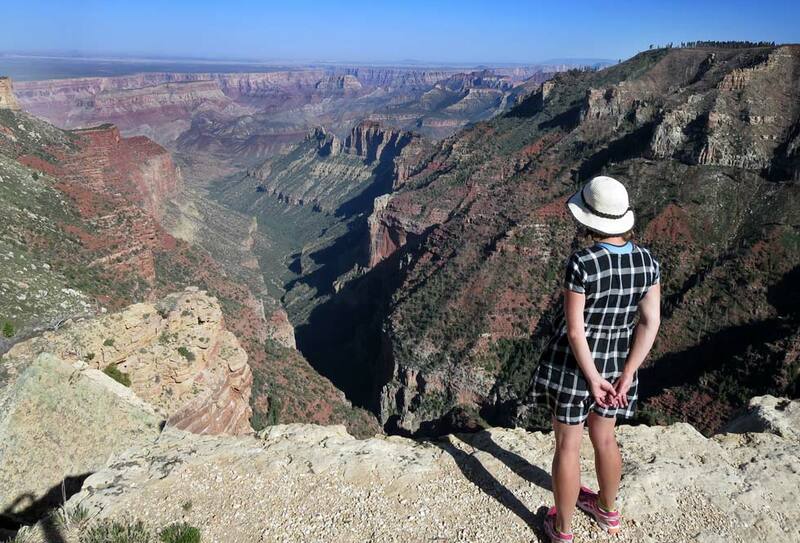 This was an exciting day that we had been looking forward to- our descent of 6000 feet + down into the Grand Canyon on ‘the most difficult of the named trails in the Grand Canyon’. It was very windy overnight with some strong gusts banging against the tent only giving us an intermittent sleep. Despite that we were up at 6 and away hiking by 7 starting with descending a tree covered ridge before we dropped off down into the canyon itself. There wass a clear trail to follow and for a while it traversed and undulated between cliff bands with tremendous views down into the canyon. Both of us were going well this morning with the shaded, rugged trail hiking and the exciting views. After rounding Marion Point we continued traversing before the trail descended south east more deliberately into Nankoweap Creek valley. 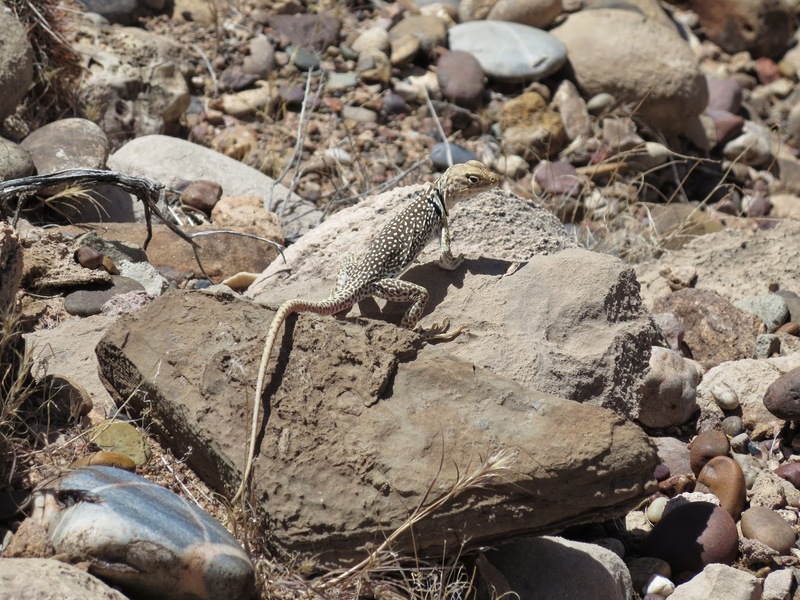 The sun was on us now and the heat notched up into the high 20s C. The terrain wass much more arid as well with thorny shrubs and giant agave peppering the dusty ground. Descending through some lovely colored rock layers of yellow, limestone white, green and black lava rock, the temperatures reached furnace like levels and we were super glad to reach cool shady cottonwood trees and trickling water at Nankoweap Creek for an early lunch break at 11:15. We had heard that the Nankoweap trail would be difficult but we found it a lovely easy hike, it is the heat that could make it hard (especially if hiking in the other direction, uphill)- it looked like there has also been recent trail maintenance carried out here to ease the way- THANKS!). 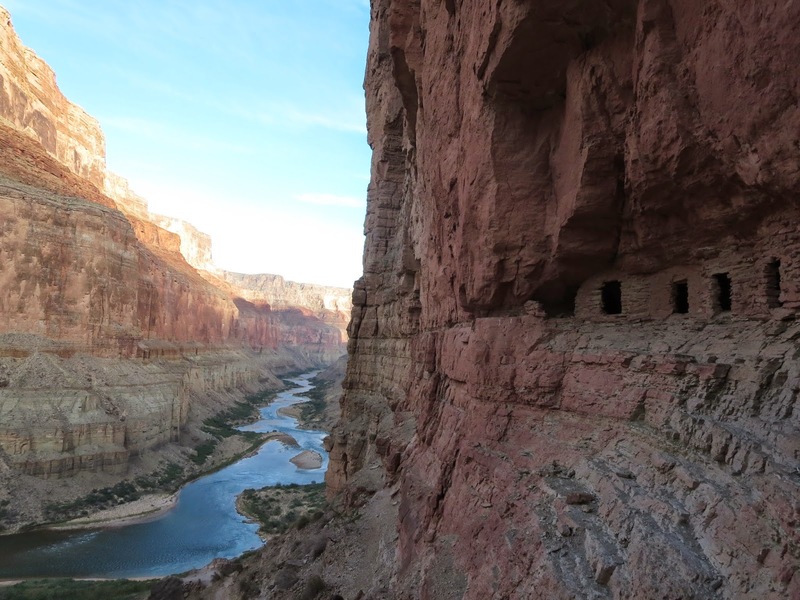 We reluctantly left the shade to descend down the rocky wash towards the Colorado river. The temperature reached body melting levels and it started to fry our brains a little as we both got grumpy but stumbled on. 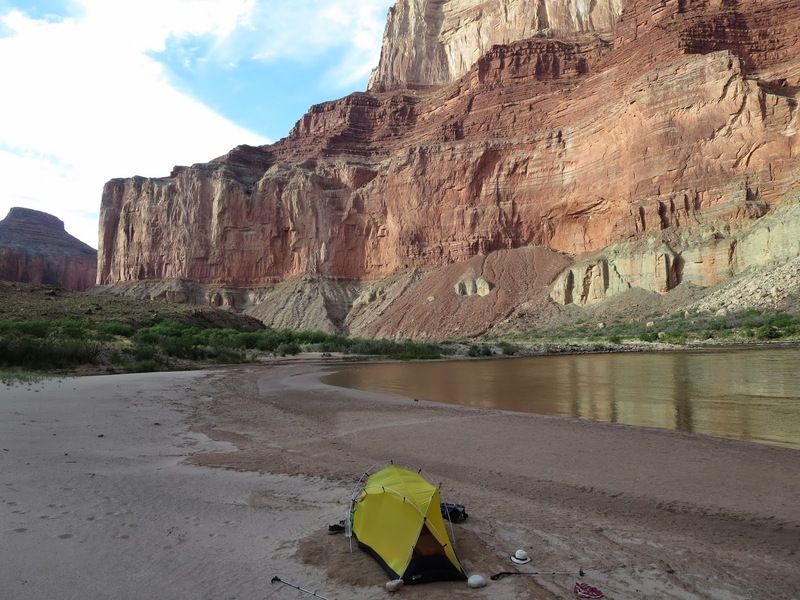 Eventually we reached the huge Colorado river in the Grand Canyon and found a lovely beach to pitch the tent in the most amazing of settings. What a fantastic place! After dinner and the sun thankfully sinking below the cliffs, we had enough energy again for an evening hike 300 feet up to the wonderful Nankoweap granaries. These are believed to be food storage caves built into the cliff around 1100 AD. The situation is also a candidate for the best viewpoint along the Grand Canyon (IMHO)- tremendous! 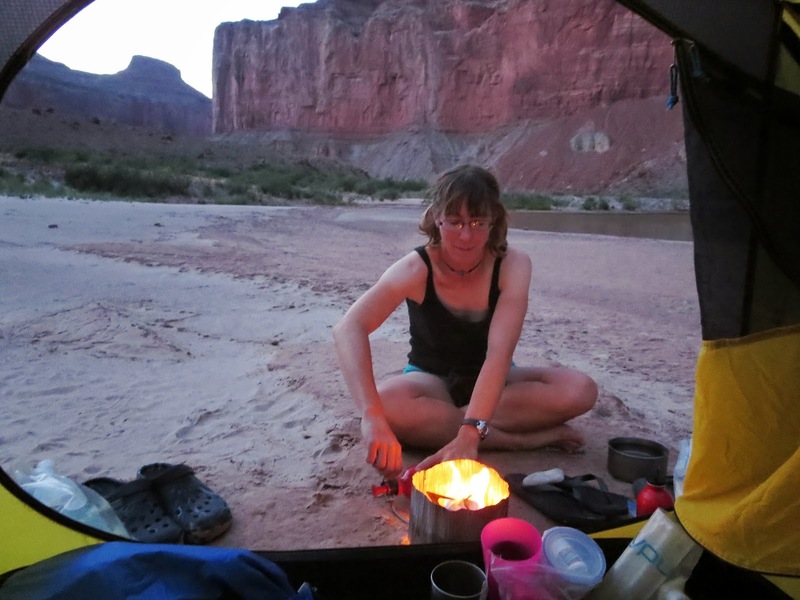 We descended back to the tent and rested with a late tea and bats swooping overhead. 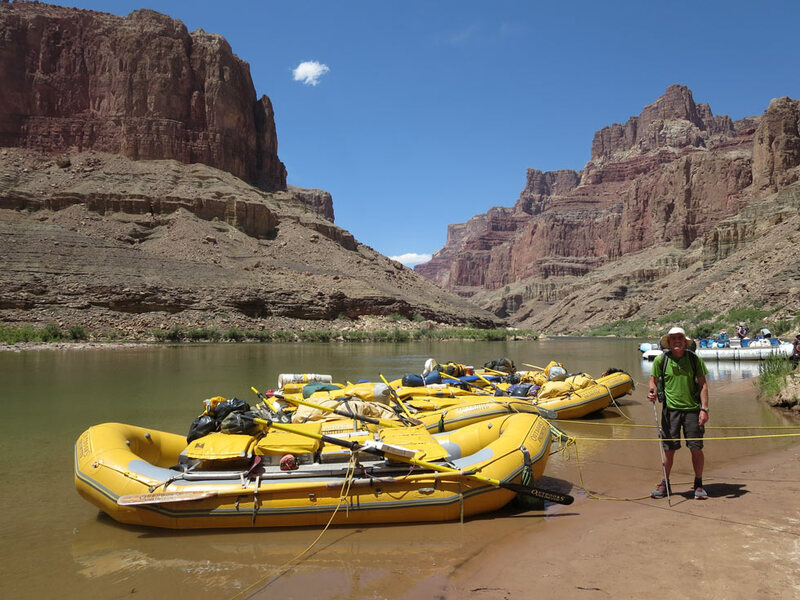 -and lastly we would then have to try and get a hitch across the Colorado river from a raft or other boat going downstream (the Colorado is way to big, deep,cold and fast flowing for us to cross without a raft or boat). Since we hadn’t seen any boat traffic on the river yesterday, the hitch might take a while! We started at 6.15 am in the delicious morning shade with sandy animal trails winding round the deep thorny vegetation. 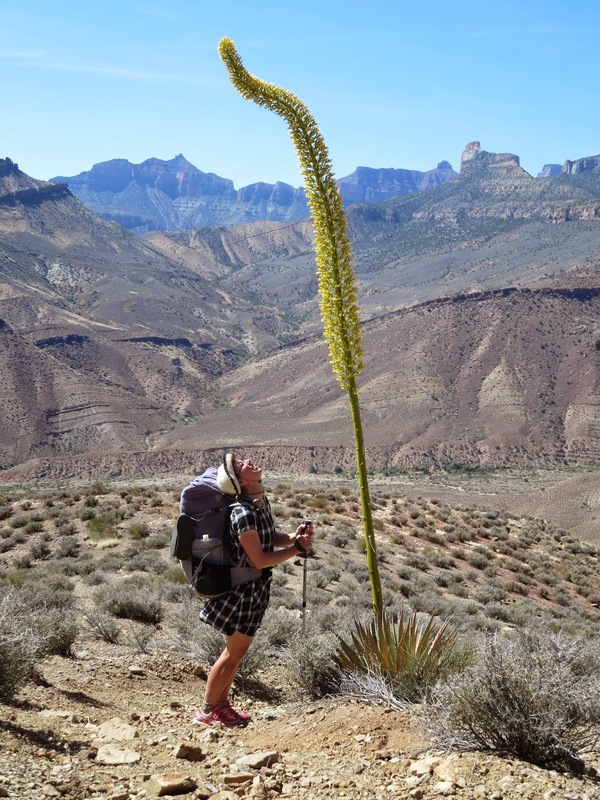 For some of the way we managed to follow the shore, wading in the shallows of the river, but mostly we boulder hopped and bushwhacked for 9 miles through every type of spiky bush and cactus imaginable! Torn, sweaty and disheveled we made it to a beautiful little sandy beach suitable for hitching a lift from a boat at 12:15. Wonderfully, the beach also came with an overhanging shady rock ledge to sit out from the blazing heat while we waited. We even snuck out from our protective shade for a refreshing swim in the river. To be honest, it was so relaxing in our shade next to the beach in this amazing place, we were both quite happy sitting around chilling, but we have next to no spare food so we really needed a lift today at least. And lo! – a couple of hours later river rafts appeared round the corner and we leapt out and waved. Phew! 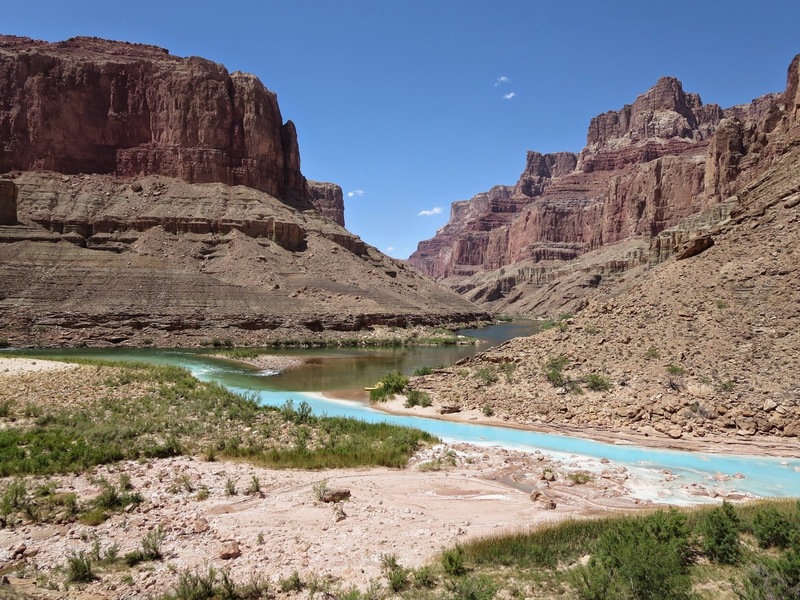 – the rafts from ‘Outdoors Unlimited’ outfitters happily agreed to take us a across!- and better, a mile or two down river to the junction of the Little Colorado and the Colorado rivers. The river raft guides were interested in our journey, and we in theirs, and we had a nice short chat before we landed at the other side of the river. We were now in a busy little spot after lot’s of time hiking alone. The rafts stopped here to let people out to hike up the Little Colorado river for a while. There were also researchers studying the ‘humpback chub’ – a fish that seems to like the mineral rich, limestone waters. The Little Colorado is a big river in its own right, draining a large part of Northern Arizona, and it was a deep wade to get across. 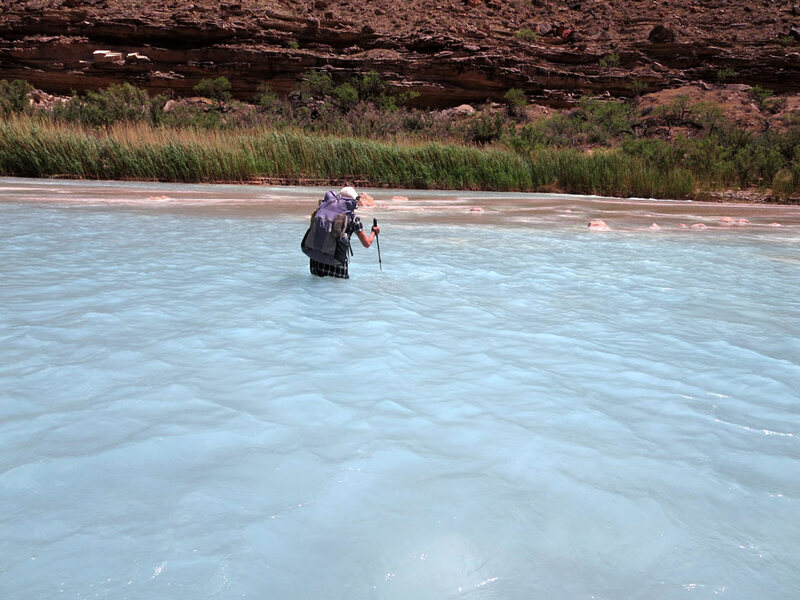 A friendly researcher took us up river though to show us the best crossing point of this beautifully turquoise blue river. It was thigh deep but the water is warm, fed from hot springs upstream, making for a relatively easy crossing in the end.